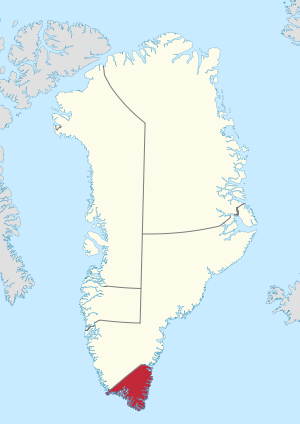 In addition to the area of the former municipalities, the southernmost tip of Greenland was added to the new administrative entity. The land area stretches from the Kangerlussuatsiaq fjord (in Danish Lindenowfjorden) to the southeastern Atlantic coast and Cape Farewell. The area previously belonged to Ammassalik Municipality and is uninhabited. The coat of arms of the municipality depicts a ram's head, symbolising the sheep farming in the area, which has become one of the most important parts of Kujalleq's economy. The uppermost part of the shield contains the sun of the Greenlandic flag. Likewise the choice of colours matches those of the country's flag. The coat of arms was adopted in August 2008. At 32,000 km2 (12,355.3 sq mi) Kujalleq is the smallest municipality in Greenland by area. Straddling the southernmost end of the island of Greenland, it is bordered by only one municipality, Sermersooq, in the north. The waters of the western coast are that of Labrador Sea, which meet the open North Atlantic at Uummannarsuaq, the southern cape. The border on the western coast runs alongside Alanngorsuaq Fjord and on the eastern coast up to Anorituup Kangerlua (Anoritoq) Fjord. The entire municipal area is highly mountainous, with numerous fjords carving deeply into the land. All settlements are located on the Western coast, or in fjords ending there. The only airport is Narsarsuaq Airport. Helicopters and boats go to other settlements. Wikimedia Commons has media related to Kujalleq. 1 2 "Kommune Kujalleq". Kujalleq Municipality. Retrieved 11 July 2010. 1 2 Greenland in Figures 2013 (PDF). Statistics Greenland. ISBN 978-87-986787-7-9. ISSN 1602-5709. Retrieved 2 September 2013. ↑ "Kujalleq - Civic heraldry of Greenland". HeraldryWeb. Retrieved May 9, 2011. ↑ "Venskabsbyer: Aarhus Kommune". 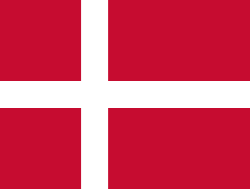 Aarhus.dk. Retrieved 2013-03-25.